When we were expecting our first baby, one of the most enjoyable parts of my pregnancy was the fun of decorating his nursery! As I soon discovered, those drool-worthy nurseries on Pinterest can easily cost thousands of dollars — even The Bump estimates that setting up a bare-bones nursery will cost $2,000. But with a little bit of strategy and some careful planning, I’m convinced that you can set up a gorgeous nursery for your little one without breaking the bank. Also — very early on in the planning process, I completely fell in love with this adorable muslin hedgehog crib sheet at Anthropologie, and with these amazing artisan floating shelves from Etsy. As a result, pretty much every other décor choice revolved around these two items. For instance, I had originally planned to use a color palette of sage green, yellow, white, and gray. I thought sage would be so soothing and sophisticated! However, the sage paint samples I selected clashed horribly with the greenery on the crib sheets, and there was no way I was willing to return my beloved crib sheets. I also knew I wanted to display all of the beautiful picture books my baby received from generous friends and family members — but the colorful cover art made the sage paint look drab and somber. Likewise, the gray I originally conceived of was beginning to look a bit serious when paired with the brown notes in the crib sheets and the heart pine shelving. In the end, “griege” turned out to be the happy compromise that complemented the brown woodland accents and also gave us the flexibility to throw in a few gray accents when convenient. Fortunately, I changed my color scheme BEFORE I pulled the trigger on actually painting the walls or making any big purchase decisions, so the only money that was wasted was $18 in sage paint samples that had been bought with a gift card. In terms of decor, we actually went quite minimal. My mother-in-law is a painter and very kindly volunteered to paint a mural of my choice in the nursery. 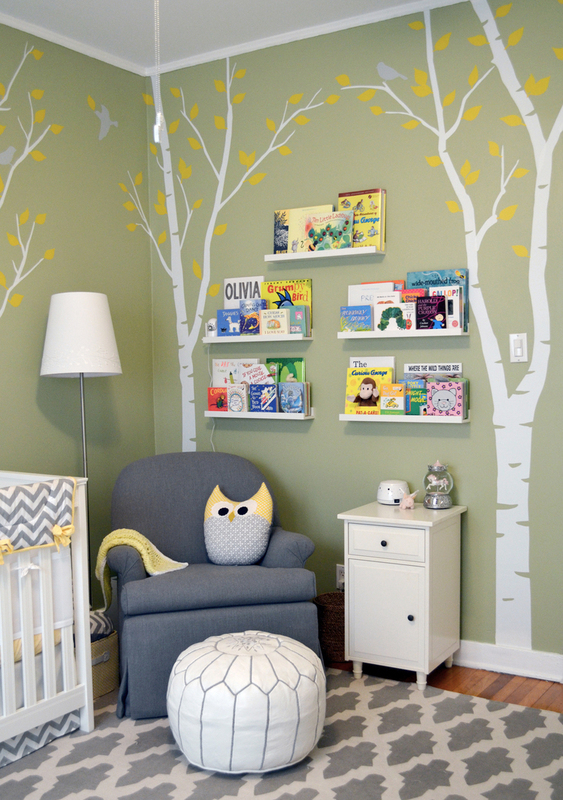 Inspired by Shauna’s nursery, I chose birch trees with yellow leaves, although I asked my mother-in-law to add more detail to the trees and for them to “criss-cross.” I love the way it turned out! Beautiful and warm, but with a touch of whimsy that makes it perfect for a nursery. On the opposite wall from the crib, we created a cozy reading corner. I love how the books serve as a colorful focal point, requiring no other wall art. Please note: I definitely recommend purchasing the IKEA crib in-store, as online shipping can more than double your cost! (the shipping calculator estimated $129 to ship it to North Carolina). Likewise, depending on where you live, the shipping fee for the floating shelves can be as high as $25. Chair. There are many glider sets that cost under $100. However, I did not like the aesthetics of the gliders I found, and I did not trust their quality or level of comfort, either. I also did not want to purchase one used, since we have pretty severe cat and dust mite allergies in the family. Painting. We definitely could have saved money by painting the room ourselves, but it was worth it to us to hire it out in order to save the time and hassle. Blackout Blinds. If your nursery already has blinds, you can skip this cost altogether! Another cheaper option would have been to use traditional, floor length curtains with a curtain rod. However, our nursery is relatively small, and I felt that having floor length curtains would quickly overwhelm the room. But if you have a large nursery, this could be a beautiful option at a lower cost. Floating shelves. I consider the floating shelves to be artwork and a focal point of my nursery – but are they strictly necessary? Of course not. If artisan floating shelves aren’t your thing, there are many inexpensive DIY options out there. Mushroom light. Obviously, no one needs a $30 wall light, so this is an easy item to oust if you’re looking to cut costs. At the end of the day, I’m really glad I splurged in each of these areas – all of these items were really important to me to get the functionality and the aesthetic I was after. That said, if you chose to economize in these areas, your total could come to less than $400! I’m so happy with how our nursery came out! To me, it’s a wonderful blend of aesthetic and function, and it’s a beautiful, cozy space where I can relax and read to my little one at the end of the day. How did you decorate your nursery without breaking the bank?